The Business Services layer - provides access to data from various sources and handles business logic. The Model layer - provides an abstraction layer on top of the Business Services layer, enabling the View and Controller layers to work with different implementations of Business Services in a consistent way. The Controller layer - provides a mechanism to control the flow of the Web application. The View layer - provides the user interface of the application. Oracle ADF Architecture Oracle ADF lets developers choose the technology they prefer to use when implementing each of the layers. 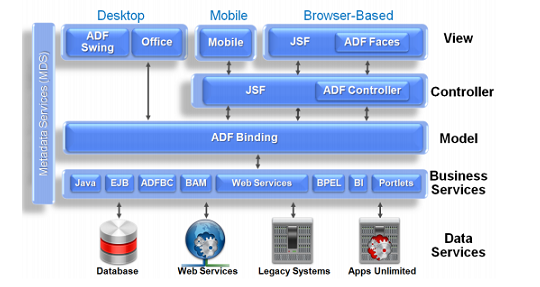 The diagram above shows the various options available for developers when building Oracle ADF applications. The glue that integrates the various components of Java EE applications and makes development so flexible is the Oracle ADF model layer. EJB, Web Services, JavaBeans, JPA/EclipseLink/TopLink objects and many others can all be used as Business Services for the Oracle ADF Model. View layers can include Web based interfaces implemented with JSF, Desktop Swing applications and MS Office front ends, as well as interfaces for mobile devices.